Twin Arts is a painting by Anna Rose Bain which was uploaded on July 15th, 2010. 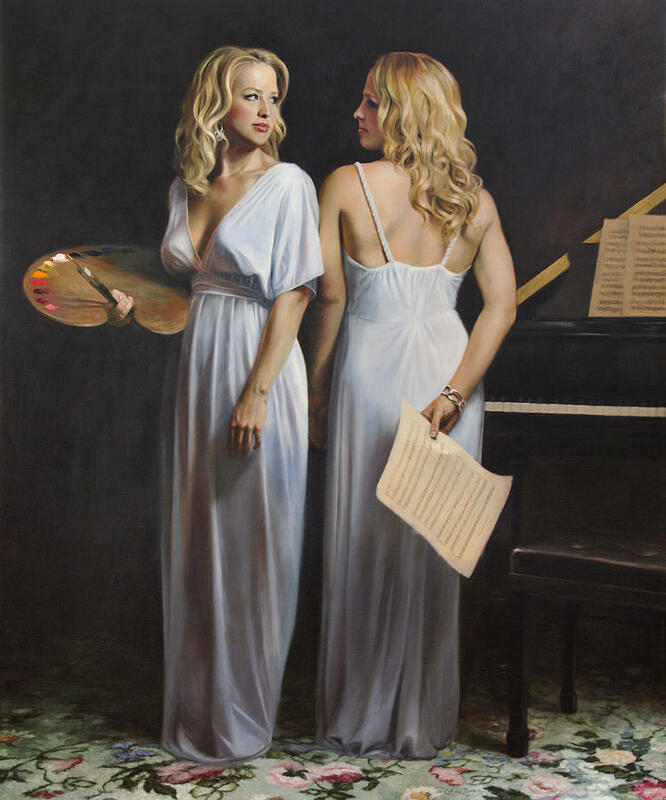 A large-scale double portrait of the artist and her twin sister, representing the intimate connection between art and music. Such superb detail. Great work, Anna! Wow, so much talent for a young woman! It's wonderful that you have been able to accomplish so much and I hope you are able to make a living from your art. I have seen this before somewhere- International Artist perhaps? Stunning!! The detail in the carpet and gowns is extremely special. I have to get an original of yours to add to my collection. Anna, I saw your work before, they are all so wonderful, & I really love this one, art & music certainly go together in fine arts, especially in classical scene, in this painting the setting is so meaningful, elegant and subtle alluring. Very unique and interesting idea to this outstanding piece of artwork of your's Anna. Incredible talent Anna! I love the colors and wonderful light you work into your fne art pieces!! This is such wonderful work, really good choice on the composition. Strikingly beautiful, congrats on your sale! Awesome Artwork - Congrats On The Sale. Congratulations on your sale Anna!! Stunning work, beautifully executed and tones perfect, f/v, congratulations on your sale. Stunning work Anna! I can't tell you how moving your work is. Just amazing.